Two new reports from the Growing Up in Ireland study were launched on Feb 21st. Both reports use data from the ’08 (Infant Cohort) and are now available here for download. A brief description of each report is given below. Infographic summaries and launch presentations for both reports are also available below the description. 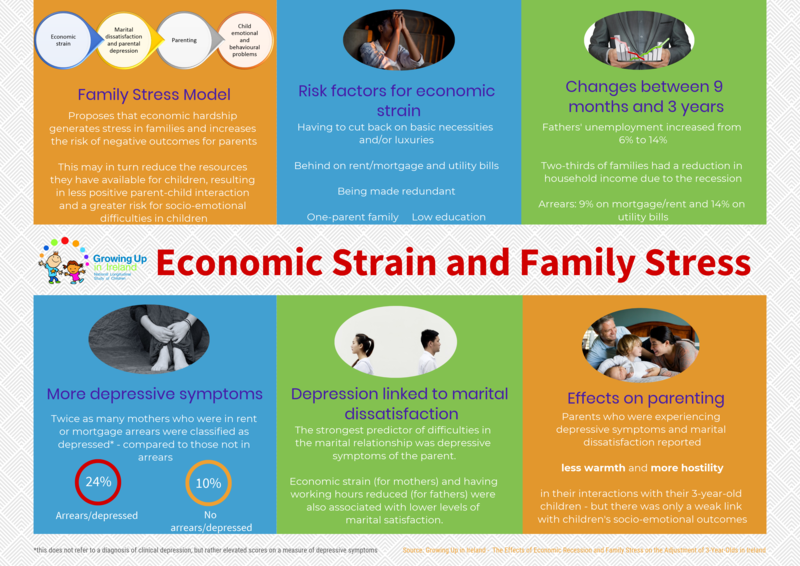 This report is concerned with understanding how the economic recession in Ireland affected stress within families, and in turn how this is associated with the behavioural and emotional adjustment of 3-year-olds. It uses longitudinal data from the ’08 (Infant) Cohort collected when the children were 9 months and again at age 3 years. The report presents further details on the lives of children from the Growing Up in Ireland study (Cohort ’08) when they were aged 5 years. The results cover the socio-economic circumstances of the families in which the 5-year-olds lived and those children’s outcomes in key domains of health, socio-emotional development (including relationship with parents) and school/cognitive development.